Lycos Internet Ltd, a digital marketing firm providing support services and software tools for online marketing, is set to enter the connected wearables space by launching devices that help users monitor their heart rate and sleep patterns among other things. The wearables range, christened 'LYCOS Life', will initially be delivered in the form of a wristband priced at $124.99 (Rs 7,625) and ring priced at $59.99 (Rs 3,660), the BSE-listed company said in a press statement. "The most valuable commodity in life is time and this technology helps LYCOS Life users maximise their time by making smarter and more informed decisions using the data they receive from LYCOS Life," said Brad Cohen, president & chief strategy officer of the company. The devices from Lycos would allow users to automatically monitor activities such as sleep pattern, heart rate and phone-related notifications such as incoming calls. Lycos claims that the wearables can sense individuals' everyday patterns and transfer this information wirelessly to a paired smartphone phone via Bluetooth and Tap to Transfer (T2T) communication protocol. The proprietary T2T protocol allows users to share data such as a phone number, address or directions with one tap. The app also allows for secure mobile payments. The worldwide wearable device market recorded its eighth consecutive quarter of steady growth in the first quarter of 2015, according to data from International Data Corporation (IDC). Vendors shipped almost three times more wearables in Q1 to 11.4 million. Kochi-based RHLvision Interactive, GOQii (a wearable devices venture launched by Indiagames' founder and its former CEO Vishal Gondal) and Hubble Connected are among the happening startups in this space. Lycos was a company spun out of Carnegie Mellon University in 1994, from a research project by Michael Loren Mauldin. 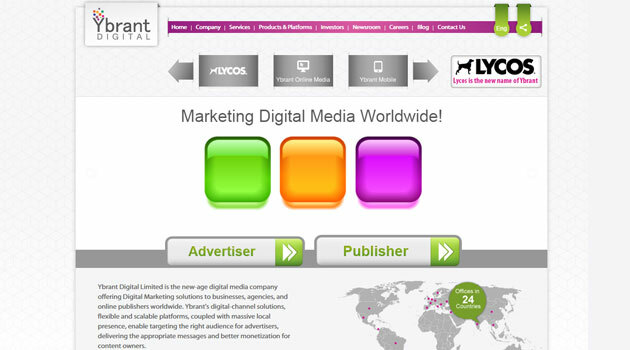 The company went through several acquisitions, and in 2010 was taken by Hyderabad-based Ybrant Digital for $36 million. In 2014, Ybrant rebranded itself as Lycos. In May, Lycos said that it will sell some of its internet patents as part of the strategy to launch "a suite of hard good products."